A stone thrown up in the air has to come back down. This is the undefiable law of nature. Let us momentarily assume that stones have a heart, a conscience, and self-awareness. Let us assume that a stone can hold desires and strive for these desires. The immediate impact of this would be that the phrase "stone-hearted" would have to be replaced with a different phrase, but let us leave that to those nameless people who are usually concerned about such things. What we are more concerned about is a single stone, a stone that wishes to defy the Universal law of Gravity, at the least, temporarily. It wishes to go up in the air, stay there for as long as it wants, and to come back down to the Earth, if at all, at its own terms. Would I be exaggerating if I claim that this stone wants to be free? You see that little image over there? I took it from a website that gives a "daily dose of inspiration". On another day, I will vent out my thoughts and rant my feelings about motivational quotes in general, and how they -- with only a negligible exception -- make me feel demotivated. 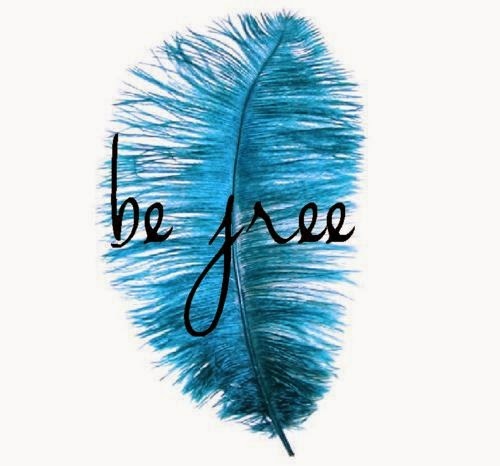 For now, I will just point out the inappropriateness of that image for that quote; for a feather is never free. A feather is dictated by winds, by gravity, by its weight -- factors that are completely out of its control. A feather, it occurs to me, is among the most un-free things around us. But what do I know? I took it from a website which has some zillion more hits on an average than my blog, and apparently, such combinations of images and texts are successful in motivating people and making them feel better. If you are one of those people who get motivated by these, I sincerely and wholeheartedly envy you. What is true freedom, then? Does my freedom lie in the ability to speak out my impulsive thoughts and call someone ugly after just glancing at them? Does my freedom lie in objectifying women just because it seems like the most natural thing to do? Does my freedom lie in acting on moments of fury and being violent? Is it freedom when I do things to please my senses rather than attempting to resist them? What is this freedom thing? On one hand, we have people who want to be free by acting as per their desires. On the other extreme hand, we have the totally incomprehensible Eastern philosophy, which calls upon people to forsake all desires, and, err, "free" their souls. Immanuel Kant, one of the most demanding philosophers ever, distinguishes between senses - which he calls as pathological or derived from animal tendencies, and will-power - which he claims to be dictated by rationality. As per Kant, or my interpretation of Kant by reading people who have attempted to interpret Kant, real freedom is in being independent of the senses, but being bound by the dictates of rationality. He seems to imply that freedom itself is illusory, and we are either a slave of the sense, or a slave of rationality. Let's try science. Science has allowed man to defy, temporarily at least, the physical laws. Wright brothers, those geniuses, showed us that we can negotiate terms with the universal law of gravity. There is a beautiful scene in Ayn Rand's Atlas Shrugged, where Dagny Taggart rides in the engines of the Rio Norte line, having built the railway line defying multiple hurdles. I don't remember this accurately, but her feeling as she sees the seemingly-infinitely lengthy railway track cutting through vast expanse of land is that of pride at human ability to achieve. I can relate to the experience because I feel a mini-version of it often - whenever I take a plane journey, or ride a bike, and more recently, when I stand in front of humongous oil pipelines and instruments. But it is the very same science that tells us that what we call as reason is just a series of chemical interactions. It can be argued that we are just machines following defined set of rules, and there is no "self". Forget freedom. You see the problem? We dont know what the "self" is. We dont know if we have a "will". We will never be able to agree if there is a "fate", a charted path that we are just following. Each of these words has been discussed for thousands of years, and we do not have anything even close to an agreement. Language is full of confusing semantics, and we will be going around in circles as long as we use improperly defined terms. Optimism is my favorite. Take a person A, who gets into a plane with a positive thought that his journey would be without an hitch. Take another person B, who gets into the very same plane expecting the plane to crash down. After a thoroughly turbulent journey, they both get down from the flight at their destinations, and we ask them about their journeys. "It was terrible, man! Totally inconvenient", says A; "I survived, didn't I? So I guess the journey was great", says B. Who is the optimist? ".. language is a trap, .. a dark evolutionary force has created language to limit human thought", goes a line from the brilliant The Illicit Happiness of Others (I have noted down pages of brilliant lines from the brilliant book, with the hope that I will be able to use them to write about the book some day). Think about it, language is limiting, no? Words that define the most important things, words that provide a reason for millions of people around the World to live for, are ill-defined. Success, happiness, morals, virtue, optimism, freedom, choice; to name a few. So, here is my humble request to those nameless people who are concerned with such things. For the sake of the people of this World, oh wait! I am sounding like an average American citizen there, extrapolating my own view to that of the World. It is about me, and me alone. Let's try this another time, please. For the sake of me, oh wait! Darn it! It occurs to me that I am projecting myself as an unique person, someone who is always concerned about such things. Why do I think I am any better than any other person? I am just as average as the average Joe. Here is one last attempt. For the sake of a part of me, that gets busy on such lonely and unengaged evenings when I have absolutely nothing at all that I am willing to do, I request you to define these terms properly. After that, I will set out trying to form opinions about all these.